Finally a day that we have at least a change to get back in the marina. No storms lurking around the corner, only light rain. Everybody is so eager to go back, that at 9:30 hrs they are all gone, bar us. Although we had agreed about leaving at 11:00 hrs. But if one does not keep to agreements, one gets punished. 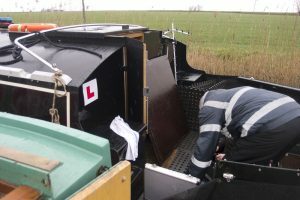 About a quarter of a mile from where he was moored, Bob breaks down, and Marc stays with him for support. I steer WRT right next to the widebeam, to enable the mechanic (Lawrance) to step across. After that it’s a clear run. There is no wind whatsoever, so WRT glides effortless onto the jetty. I don’t even touch our neighbouring boat or the jetty. That’s everybody safely back at the marina. We’ve done 42 miles, 18 bridges, 12 locks, much of this in the most horrible weather.